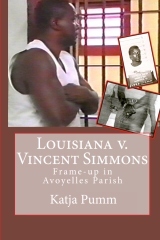 After seven years of studying and research, German author Katja Pumm has finished writing a true crime story entitled “Louisiana v. Vincent Simmons: Frame-up in Avoyelles Parish” and published in the USA. She explains in this new book why the criminal case of 1977 is unfinished business, how the political system furthers miscarriages of justice, and why exonerating evidence does not always free innocent prisoners. “If he was not guilty, he would not be in prison,” so the argument goes about inmates. And yet, DNA evidence frees two or more innocent prisoners each month in the United States of America. But, the great majority of the wrongly convicted cannot make use of this forensic science because there is nothing to test or for other reasons (e.g. destroyed or contaminated blood samples, denial by prosecutors and judges). African-American Vincent Simmons is one of them. In 1977, white minor twin sisters reported a “black man” had raped them. Before the police made a proper investigation, they arrested Simmons without probable cause near the old St. Joseph cemetery on Waddil Street at Marksville, put him in an illegal line-up, and shot him almost to death in the interrogation room. (See timeline.) He has maintained his innocence from the start. United States v. Davis, 458 F.2d 819, 821 (D.C.Cir.1972). Despite exonerating evidence that the prosecutor withheld until 1993, courts continue to deny Simmons a hearing. He is still serving a one hundred-year sentence at the infamous Angola prison. Louisiana v. Vincent Simmons: Frame-up in Avoyelles Parish examines this case and its background in detail from all angles. This book discloses the major issues that often lead to judicial errors. It reaches out in simple language to laymen, professionals and legislators. Preview: Here you can have a look into the book. Poll: Vote on whether or not you want Vincent Simmons to be granted an evidentiary hearing or retrial. Wear what you support for the world to see and get the message out. Click here to get to the Merchandise page and purchase the items at cost price. Go to Facebook and share what you like. This book is available in several book stores as e.g. CreateSpace (US$ 3.00 off, if you use the code of the coupon) and Amazon. Go to http://vincentsimmons.iippi.org/e-store/ to learn more. I have not read the book, but happened upon this site by accident. I just finished a 6 year term at Allen Correctional Center and can tell you personally about corruption there. It seems as if a lot of money is being made through the La. prison and jail system. It just doesn’t go to the state. Too many things go on behind the prison walls that the public is not made aware of.